Bob was born in Fort Worth, Texas, and raised in Sylacauga, Alabama. 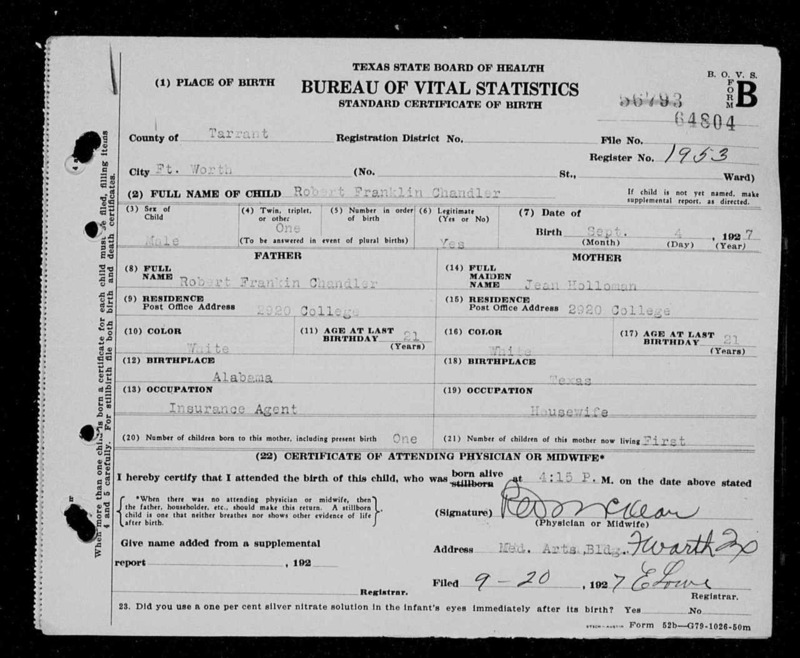 He was the first child of Robert Franklin Chandler Sr. (1906-27 December 1977), an Alabamian insurance agent, and Jean Holloman (1906-10 May 1945), a Texan housewife. Bob mentioned having a cousin and several Cherokee relatives in Oklahoma. However, a distant relative disputed his Cherokee heritage, and his son's DNA test results in 2018 belied any American Indian descent. Bob has said that he was "interested in the world" around him since he was ten, and began collecting foreign stamps as a child in the 1930s: his first stamp was of Michael I of Rumania. He also developed an interest in foreign music, eventually collecting some 15,000–20,000 LPs from various genres and cultures. It is not clear how this collection fared in the fire, but it was apparently not a total loss, as Chris offered to sell some of the albums to Catherine's cousin Al in late 2014. A 1942 yearbook from Sylacauga High School lists a "Bobby Chandler" in the freshman class and glee club, suggesting that he graduated from this school in spring 1945 before matriculating at Auburn University as an aeronautical engineering major that autumn. Bob apparently had knowledge that the Army desired, was conscripted as a special draftee in 1946 and placed in the Signal Corps. There, he learned how to install valve systems, switchboards, and telephones. After basic training and Signal School, Bob was sent to Korea for a year to install infrastructure with the American occupation force. Serving until 1948, he was entitled to the WWII Victory Medal: his service number was 44107856. Figuring he'd get "swallowed up" at a big college, Bob picked a small college, Jacksonville State Teachers College, after leaving the military. He studied pre-engineering and joined the band there for two years before returning to Auburn University, where he studied electrical engineering and graduated in 1952. As an engineer, he never learned to spell properly. While he was at Auburn, he was a member of Phi Mu Alpha, a social frat dedicated to men who are interested in music. Bob worked for Western Electric as an engineer for 40 years. There, he designed a variety of electrical subsystems. He eventually went to work for General Electric in upstate New York. Since New York is too cold (and Yankee) for Bob, he moved away after three years, working in North Carolina for some time. He worked with both Goodrich and Goodyear. With General Electric, Bob was responsible for at least seven patents. Barbara claimed, in an e-mail to Miyamoto, that without Bob's influence in the computer world, the NES "might not have arrived so soon", ignoring the fact that the NES was designed and released in Japan in 1983, without influence from American electronics. When exactly Bob did retire is not known. During the 1980s, the standard age of retirement for men in America was 65, with many choosing to retire even sooner. Bob was born in 1927, meaning that he was most likely retired by the late 80s or early 90s. The Richmond Times-Dispatch article about Chris's name change clearly says that Bob was retired at the time the article was publised (29 December 1993). ↑ (page 269 of the 1952 yearbook) G.I. Bill.